Allez, viens en Côte d’Ivoire ! 1 Allez, viens en Côte d’Ivoire ! Villes principales : Abidjan, Yamoussoukro, Bouaké, Korhogo Peuples ethniques : Baoulé, Agni, Bété, Yacouba, Sénoufo, Malinké Yamoussoukro, the administrative capital of Côte d’Ivoire since 1983, is the hometown of former President Félix Houphouët-Boigny. 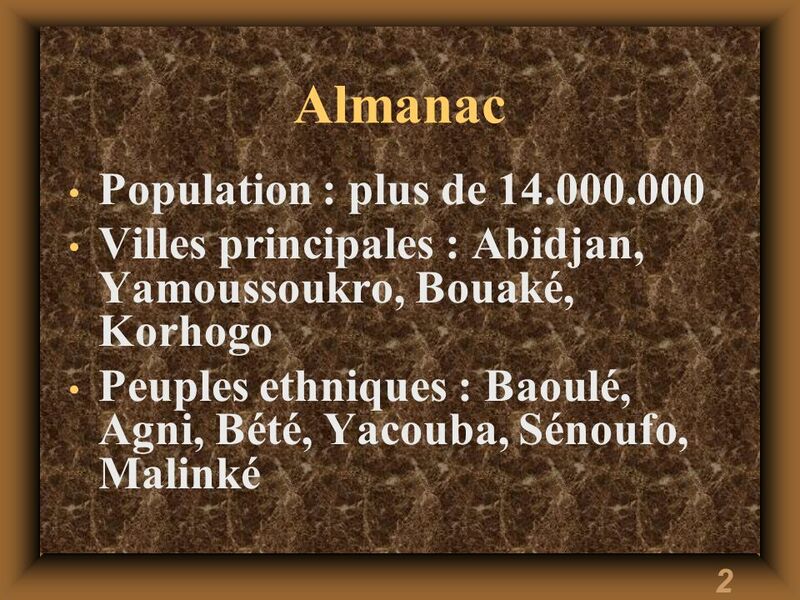 The Baoulé, the largest ethnic group in Côte d’Ivoire, migrated from Ghana over two hundred years ago. They are known as excellent goldsmiths and weavers. La reine Abla Pokou, the famous queen of the Baoulé people, led the migration of the Baoulé from Ghana to Côte d’Ivoire in the 18th century. The Agni also originated in Ghana and settled primarily in eastern Côte d’Ivoire. The Bété, who settled in the south-western forest region of Côte d’Ivoire more than 1,000 years ago, are known for their masks. The Sénoufo settled in the northern part of the country in the 16th century. They are known for their elaborate statues and masks. The Malinké, originally from what is now Guinea and Mali, live in northern Côte d’Ivoire and are famous for their rich musical heritage and pottery. Le parc national de la Comoë is the largest game park in West Africa. Festivals : la Fête des ignames, la Fête de génération, la Fête des masques Have students look at the Sénoufo village on pp The structure of the buildings is economical, practical, and comfortable at the same time. Villagers use straw from the surrounding fields for the roofs and beaten or stabilized earth bricks for the walls. With this kind of structure, air-conditioning is not needed, despite the hot temperatures, since the straw roof ensures that the temperature is spread out evenly, and the gap between the top of the walls and the roof provides for a cooling flow of air. The narrower structures in the photo are granaries used to store sorghum, millet, and other grains. They are elevated on clay supports (pieds de terre) in order to protect the grains from the humidity and rodents (rongeurs). 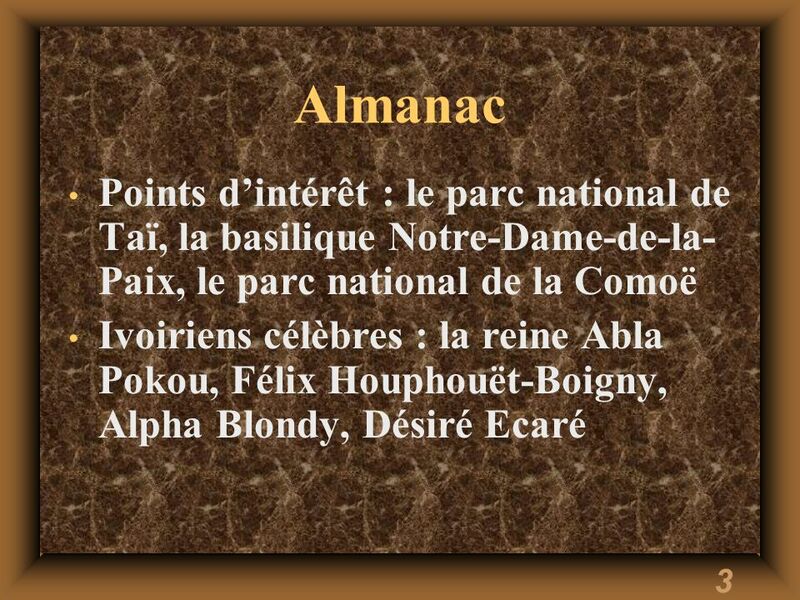 La Fête des ignames is a harvest ritual observed by the Agni and the Abron, who belong to the Akan ethnic group. 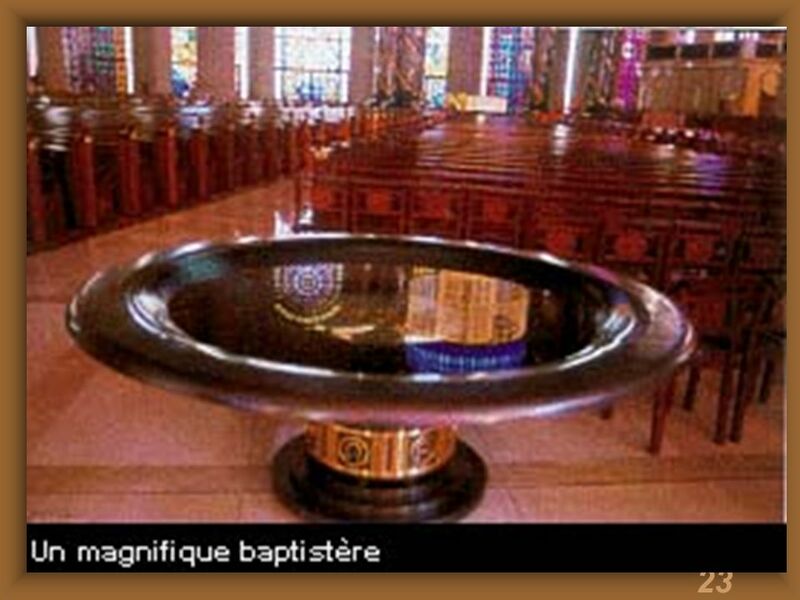 La Fête des générations is a celebration of various generatoins throughout the country. The Adioukrou hold this festival just before the children return to school. 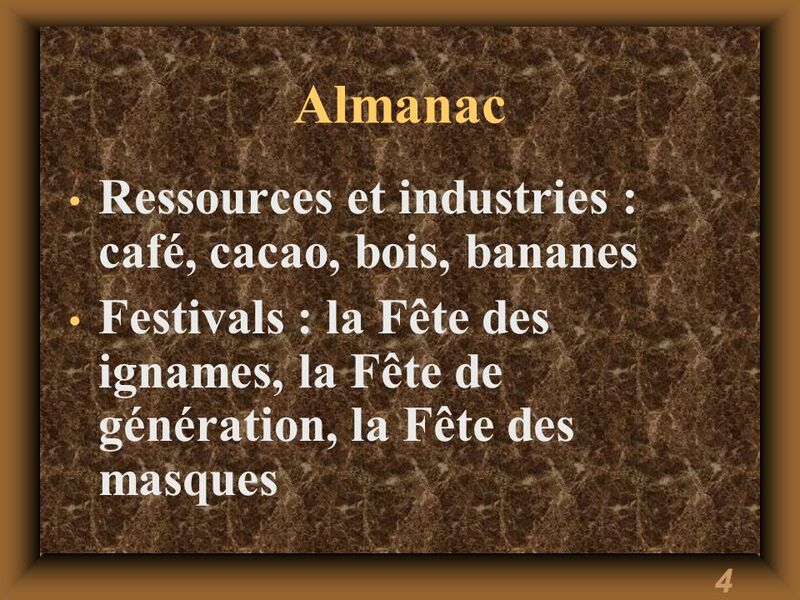 During la Fête des masques, held in Man every November, one can see more than 100 masks from nearby villages. Throughout West Africa, it is believed that masks appease the ancestors and minor deities who are intermediaries between people nad god. 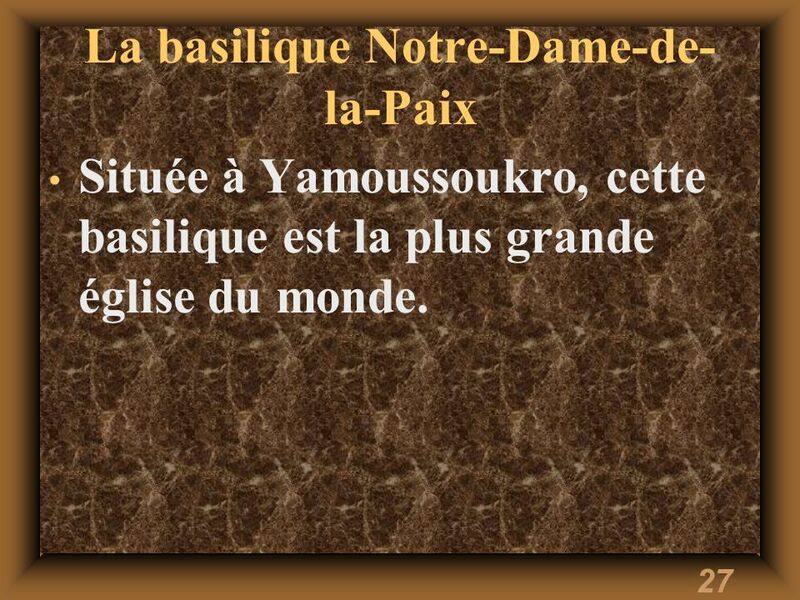 They are also thought to ward off evil. 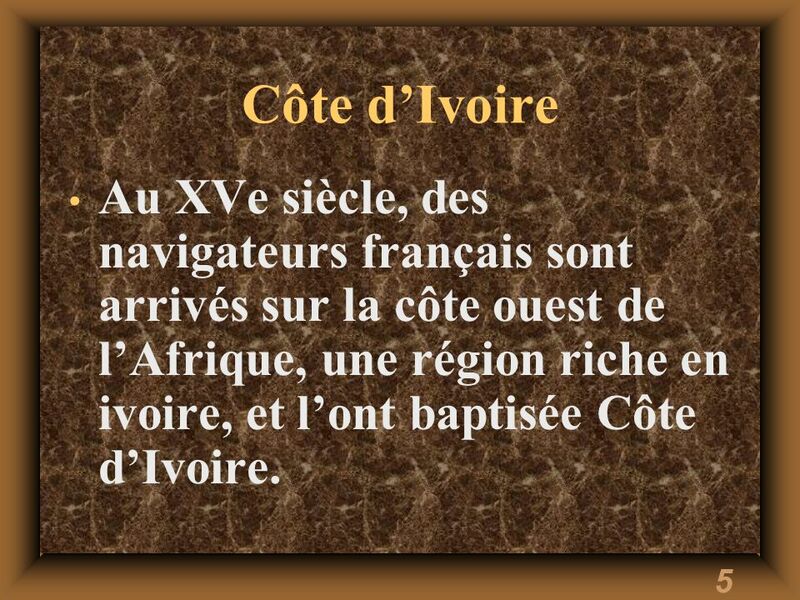 5 Côte d’Ivoire Au XVe siècle, des navigateurs français sont arrivés sur la côte ouest de l’Afrique, une région riche en ivoire, et l’ont baptisée Côte d’Ivoire. 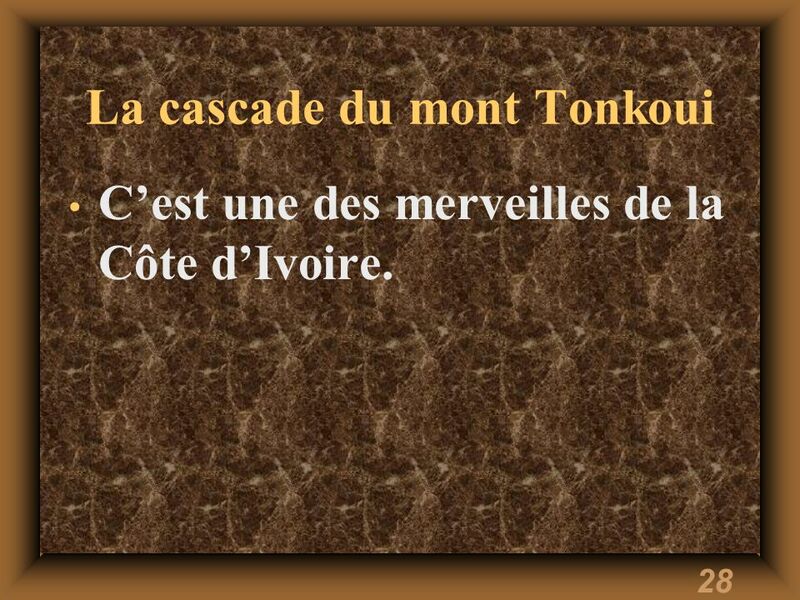 Côte d’Ivoire got its name from the ivory trade, which once flourished, but has since been banned in many countries around the world. Consisting mostly of rain forest, the southern half of the country has a tropical climate with oppressive humidity and abundant rainfall. The northern half, which is savannah (treeless plain), tends to be hotter and drier. 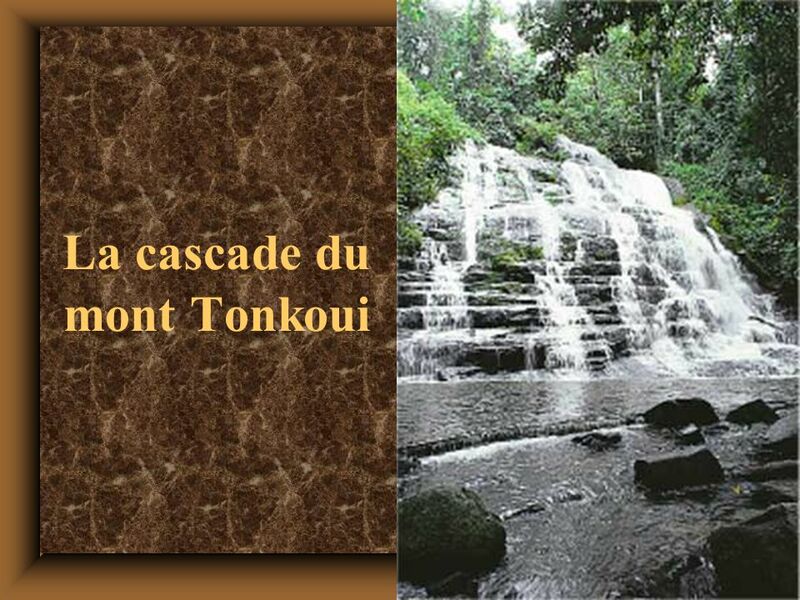 In addition to French, which is the national language, more than 60 ethnic languages are spoken in Côte d’Ivoire. 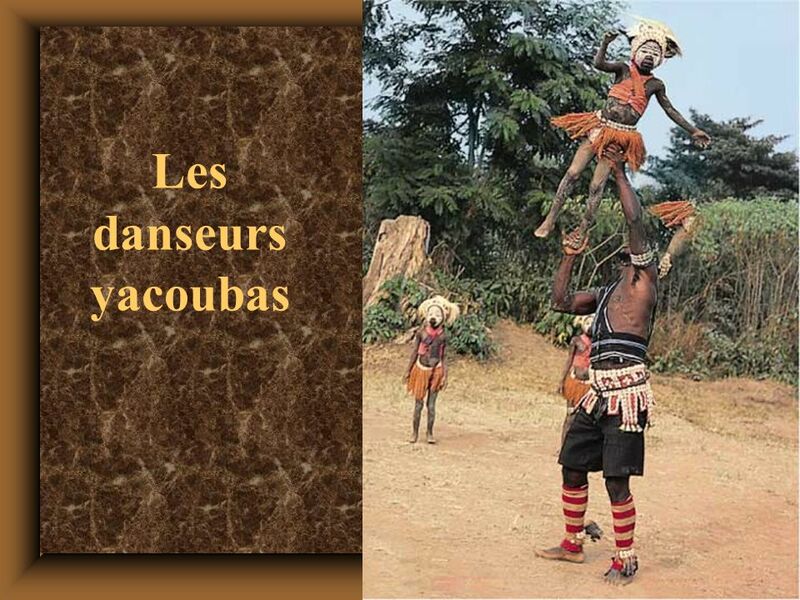 Djoula, the market language, is spoken at least minimally by most Ivorians. 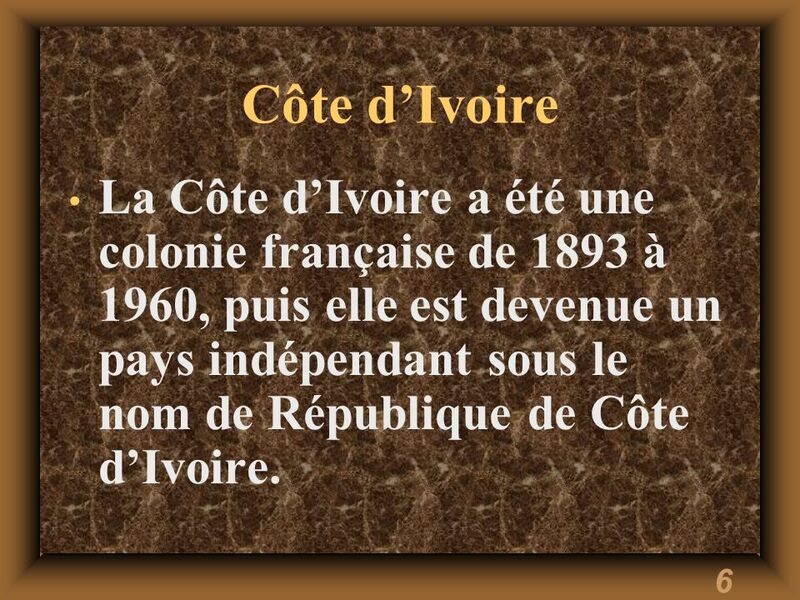 6 Côte d’Ivoire La Côte d’Ivoire a été une colonie française de 1893 à 1960, puis elle est devenue un pays indépendant sous le nom de République de Côte d’Ivoire. 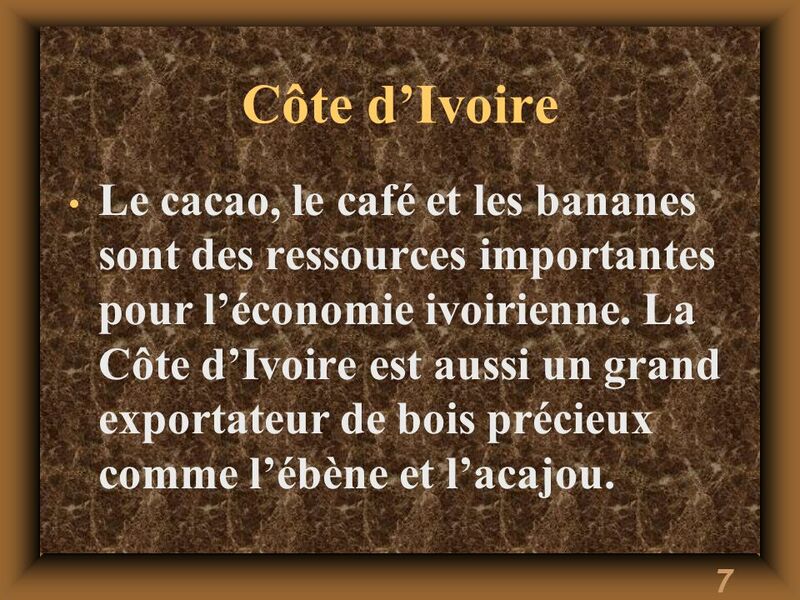 7 Côte d’Ivoire Le cacao, le café et les bananes sont des ressources importantes pour l’économie ivoirienne. La Côte d’Ivoire est aussi un grand exportateur de bois précieux comme l’ébène et l’acajou. 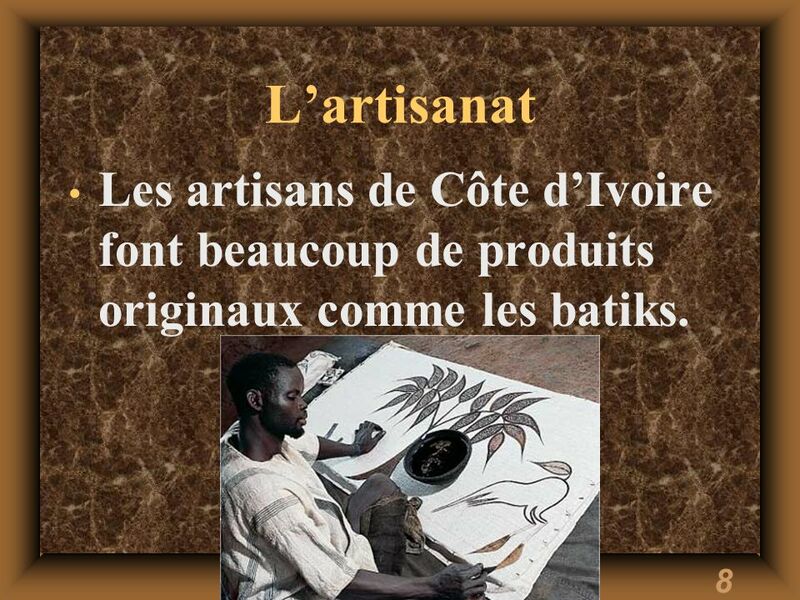 8 L’artisanat Les artisans de Côte d’Ivoire font beaucoup de produits originaux comme les batiks. 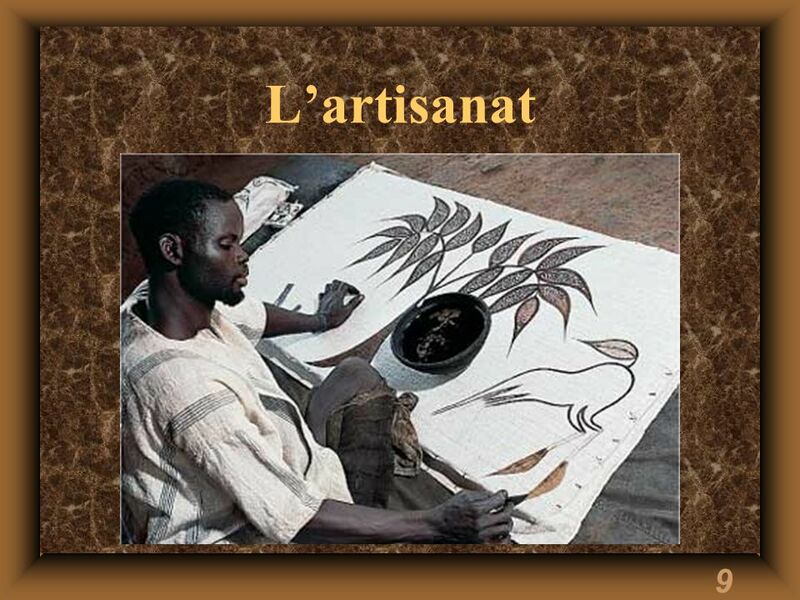 9 L’artisanat Korhogo, located in northern Côte d’Ivoire, is the main city of the Sénoufo. The Korhogo region is surrounded by artisan villages, known for their weavers, blacksmiths, potters, woodcarvers, and painters of tapestry and cloth. Batiks (tapestry or painted cloth pictures), or toiles (painted canvas or cloth), similar to the one shown in this photo, are made in the villages of Fakaha and Katia. These tapestries, or cloth pictures, are generally pieces of canvas, burlap, or gunnysack with images of black and brown animals and other patterns painted on them. 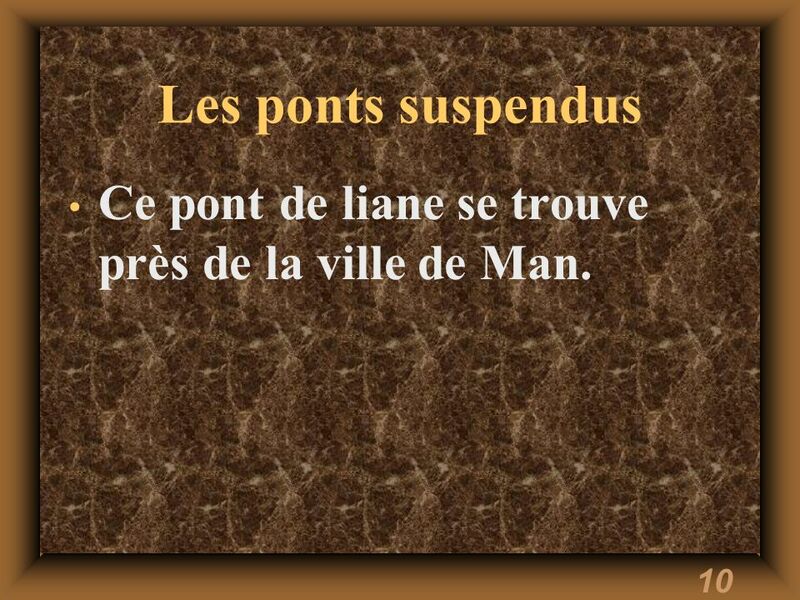 10 Les ponts suspendus Ce pont de liane se trouve près de la ville de Man. 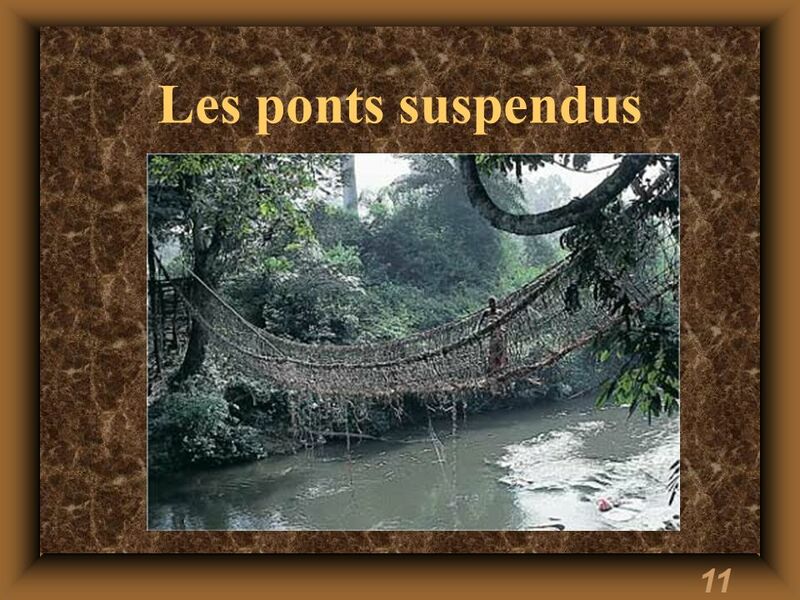 In western Côte d’Ivoire, travelers encounter various points de liane, which enable them to cross the streams and rivers. These swinging bridges are made of tough, slender vines called liane, rope, and several thin branches. 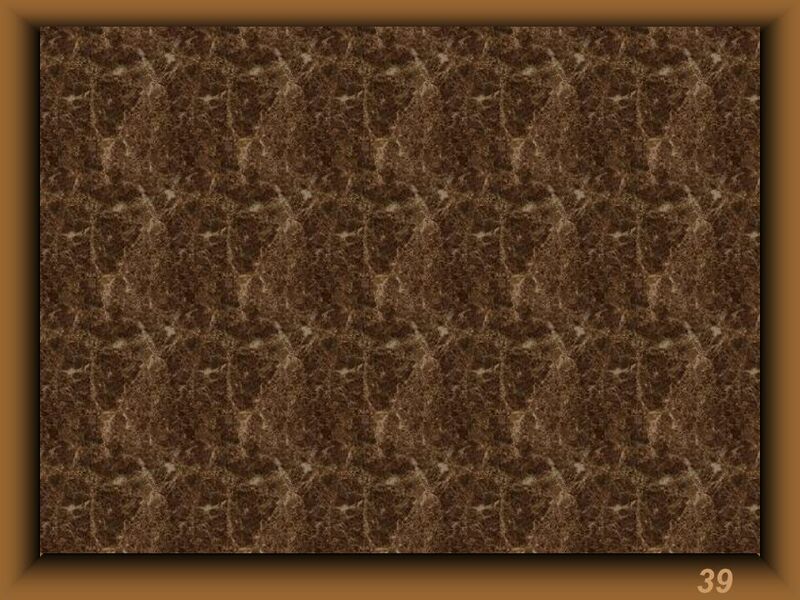 Since they are considered sacred and must not be touched by the soles of shoes, the bridges must be crossed barefoot. Although they are destroyed every year by torrential rains, they are patiently rebuildt by the local villagers, sometimes overnight! 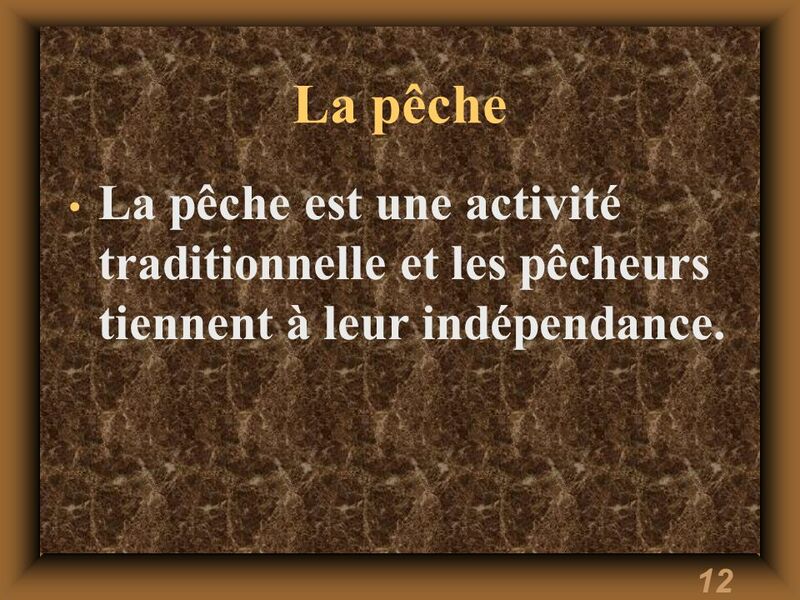 12 La pêche La pêche est une activité traditionnelle et les pêcheurs tiennent à leur indépendance. One of Côte d’Ivoire’s most interesting fishing villages is Sassandra, located on the Atlantic coast five to six hours west of Abidjan. Sassandra is assumed to be a contraction of San Andrea, a name given by the Portuguese, who were visitors to the area in the 15th and 16th centuries. 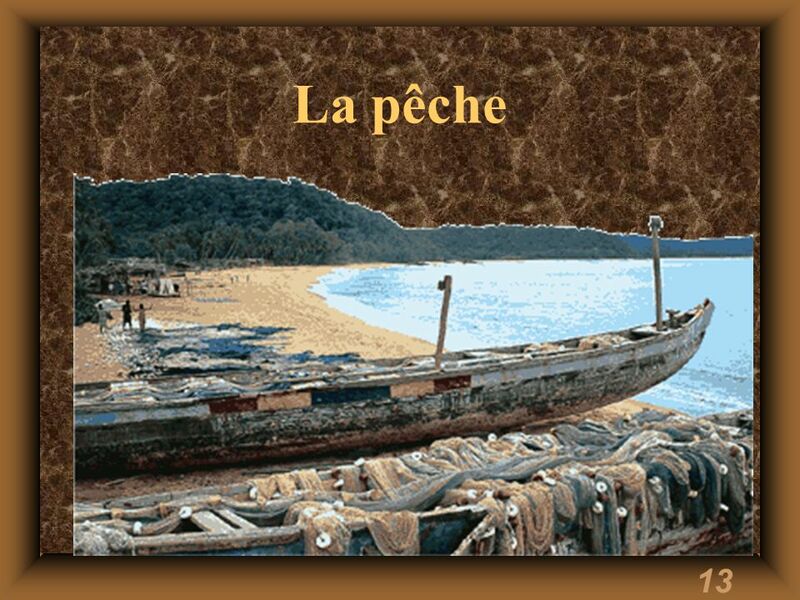 The town is inhabited by the Néyo people, who are well-known fishermen (pêcheurs). 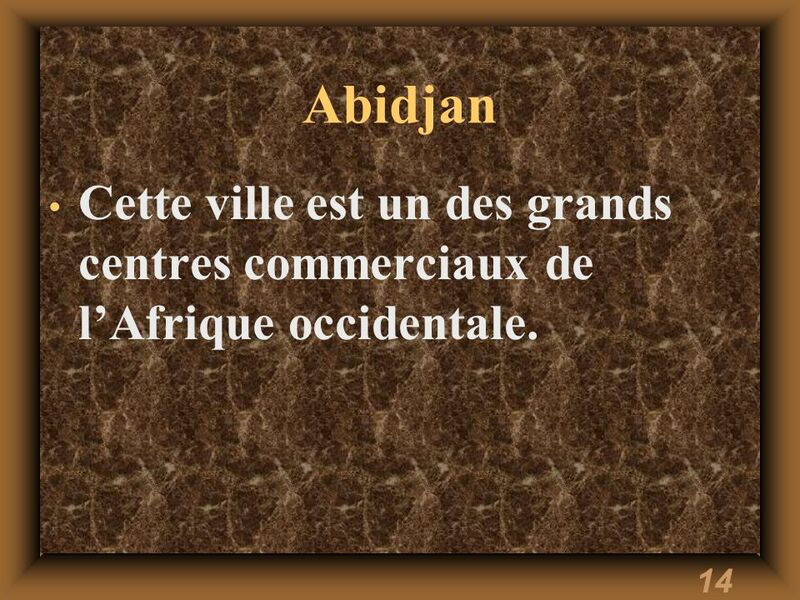 14 Abidjan Cette ville est un des grands centres commerciaux de l’Afrique occidentale. 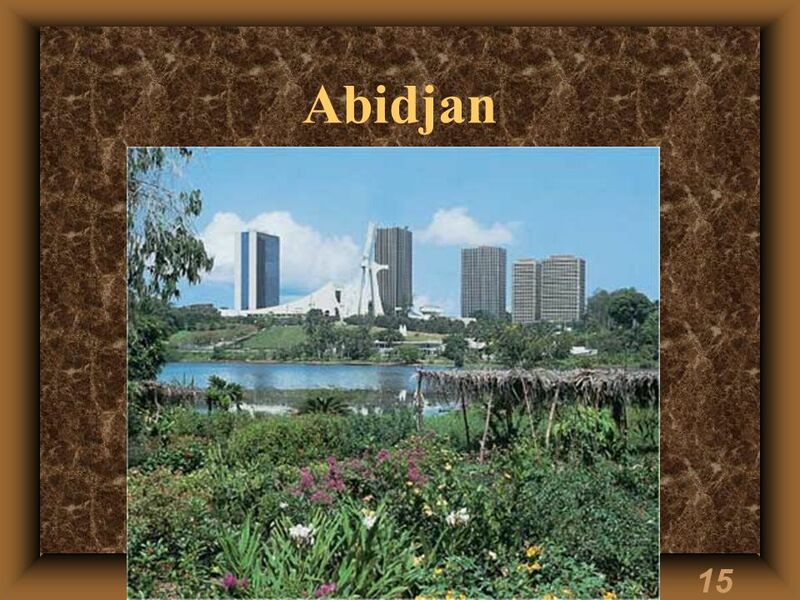 Abidjan, former capital of Côte d’Ivoire, remains the diplomatic and economic center of the country. The city grew rapidly after the Vridi Canal was built in 1950. The canal connected the city to the lagoon and created a protected, deep-water port. 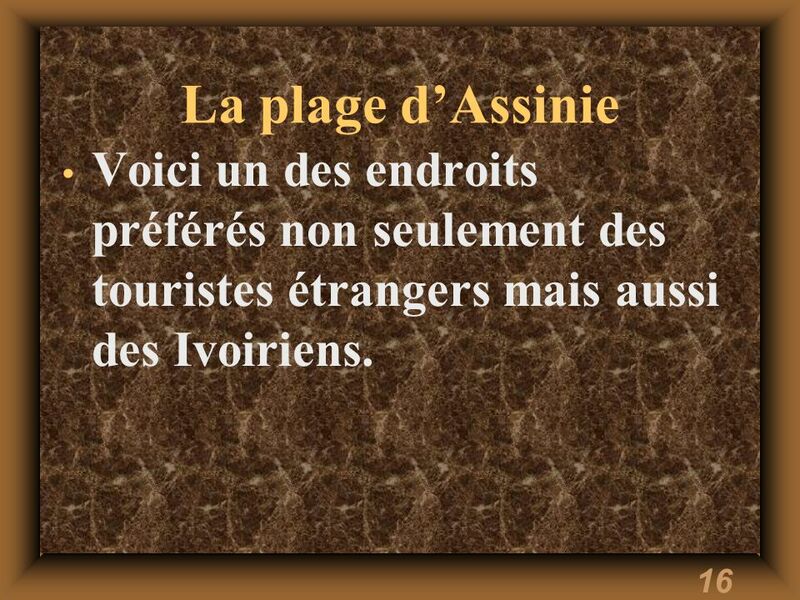 16 La plage d’Assinie Voici un des endroits préférés non seulement des touristes étrangers mais aussi des Ivoiriens. 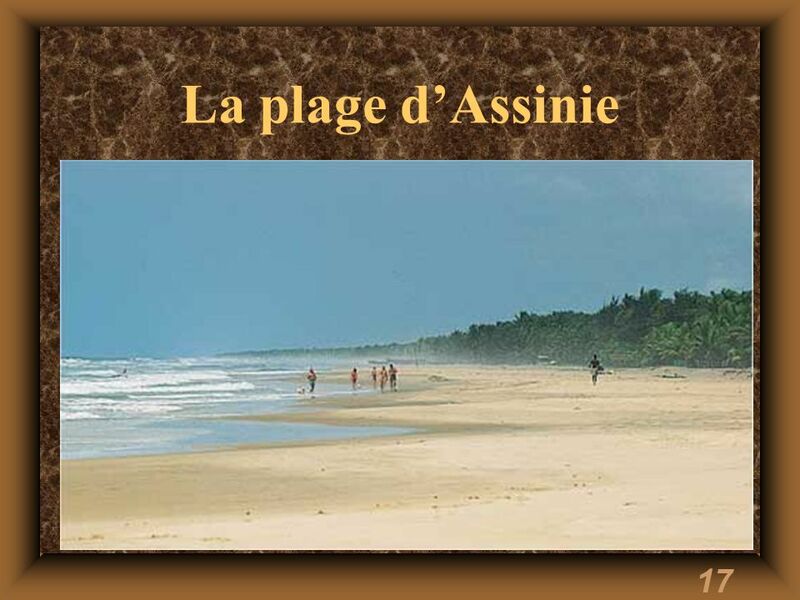 La plage d’Assinie, located two hours east of Abidjan, is reputed to be one of the best beaches in Côte d’Ivoire. 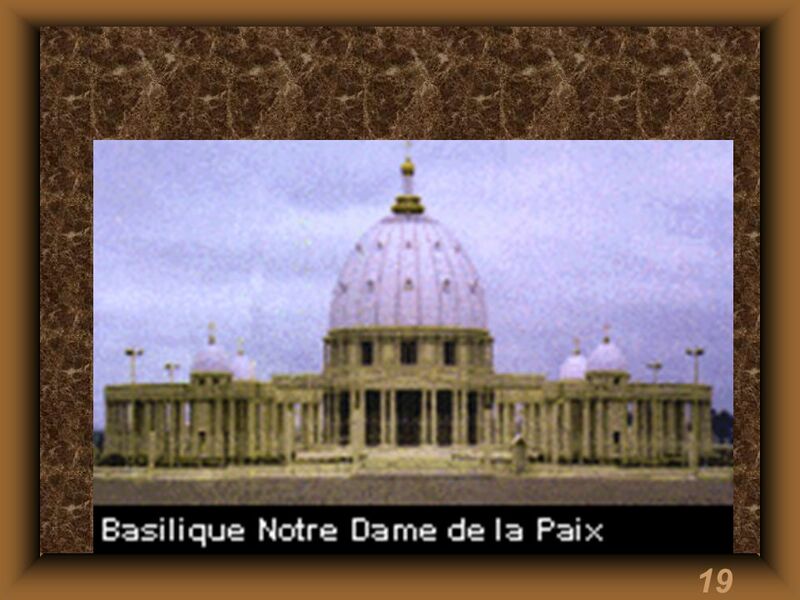 La basilique Notre-dame-de-la-Paix, a replica of St. Peter’s Basilica in Rome, is larger than St. Peter’s and is the world’s largest church. 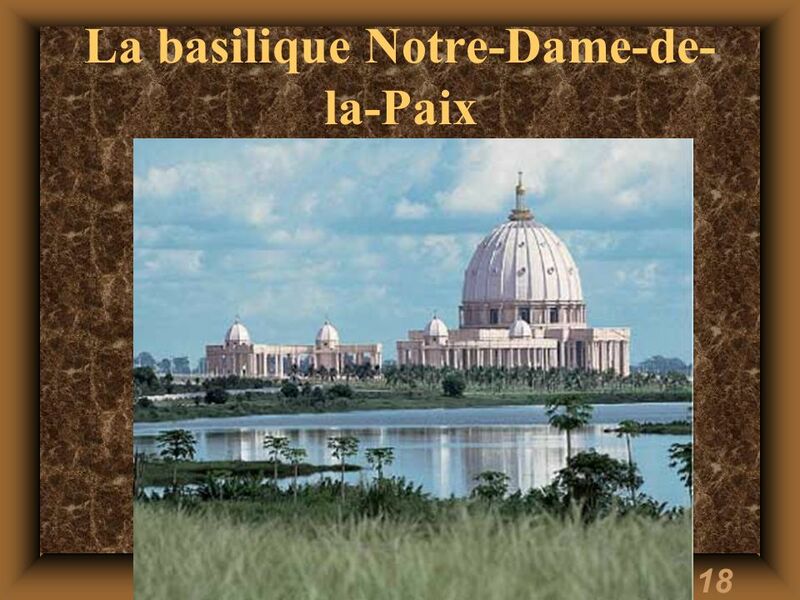 It was built in only three years, compared to 100 years for St. Peter’s. 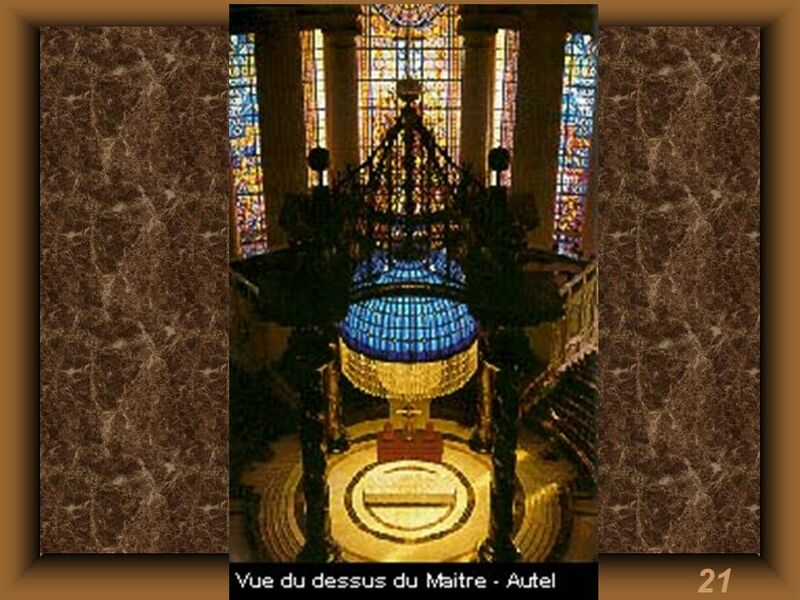 Designed to hold 7,000 people, the basilica contains 30 acres of marble and 4 times the amount of stained glass found in the Notre-Dame Cathedral in Chartres. It is also the world’s largest air-conditioned space. 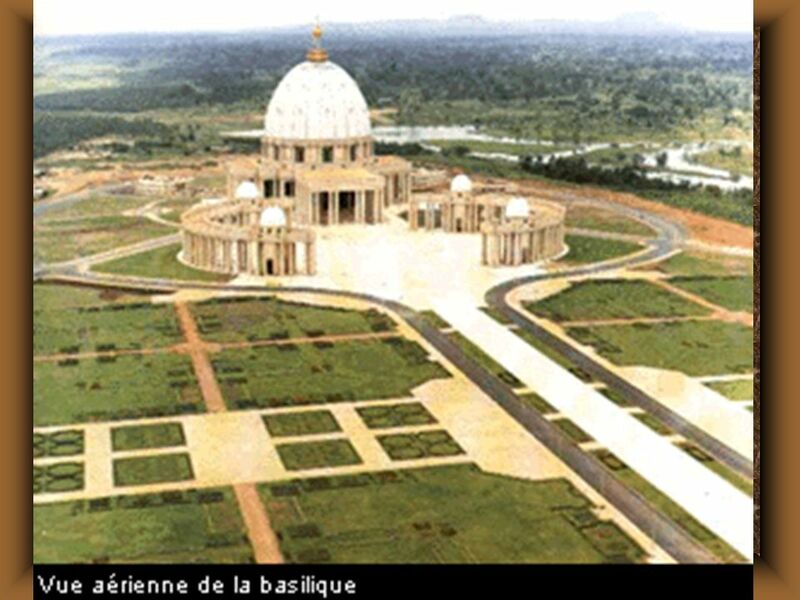 Située à Yamoussoukro, cette basilique est la plus grande église du monde. 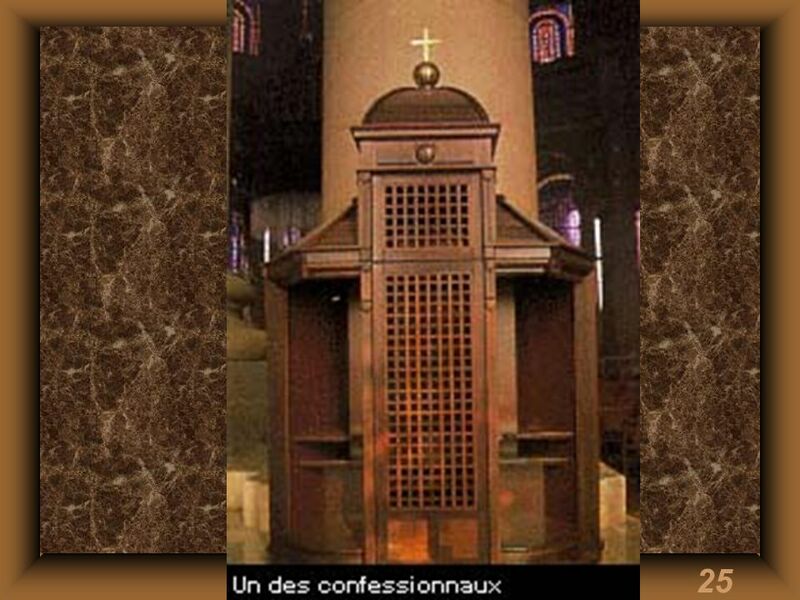 C’est une des merveilles de la Côte d’Ivoire. 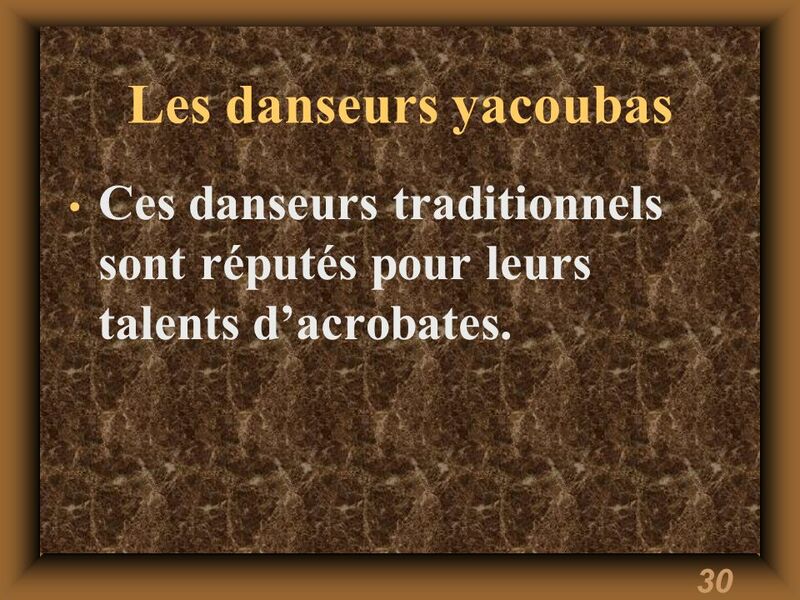 30 Les danseurs yacoubas Ces danseurs traditionnels sont réputés pour leurs talents d’acrobates. 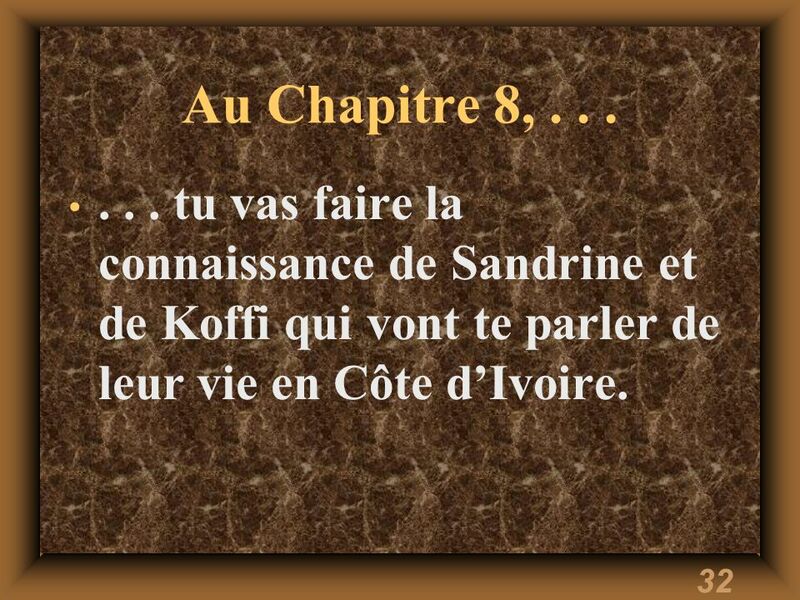 32 Au Chapitre 8, . . . . . . tu vas faire la connaissance de Sandrine et de Koffi qui vont te parler de leur vie en Côte d’Ivoire. 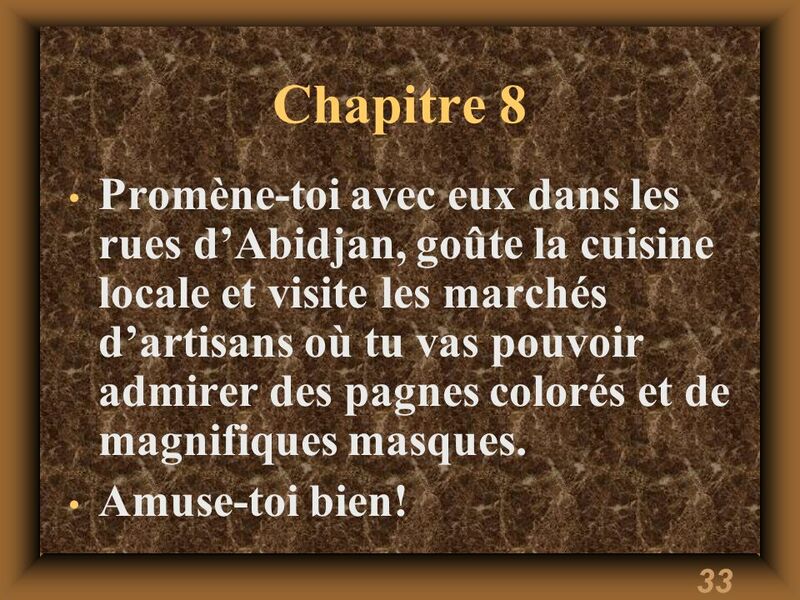 33 Chapitre 8 Promène-toi avec eux dans les rues d’Abidjan, goûte la cuisine locale et visite les marchés d’artisans où tu vas pouvoir admirer des pagnes colorés et de magnifiques masques. 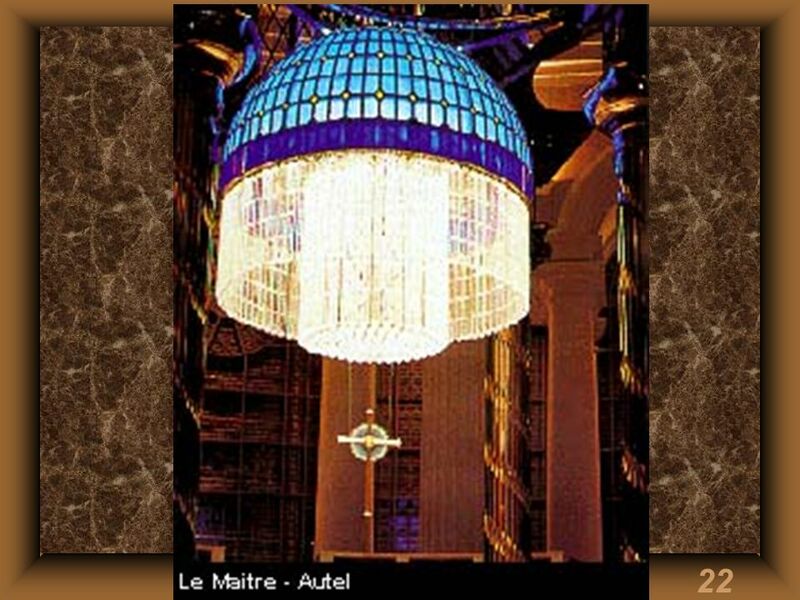 Amuse-toi bien! 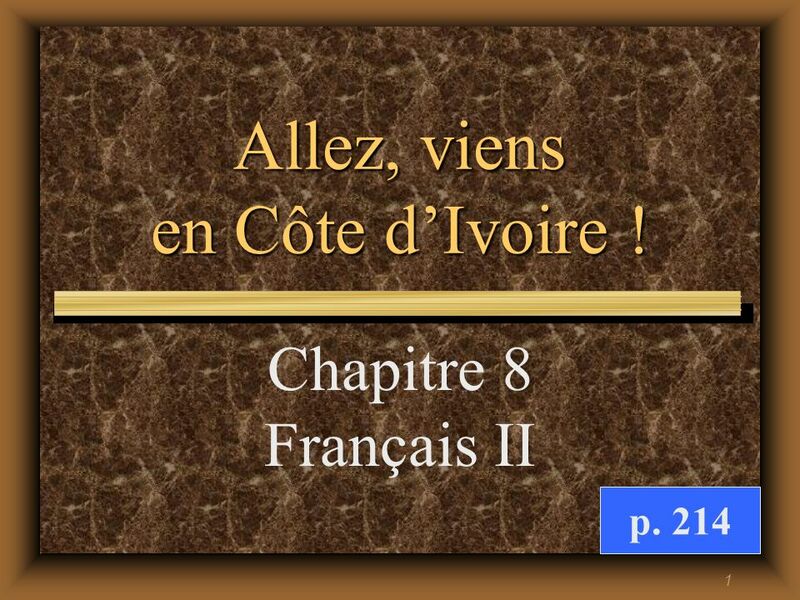 Télécharger ppt "Allez, viens en Côte d’Ivoire !" 1. 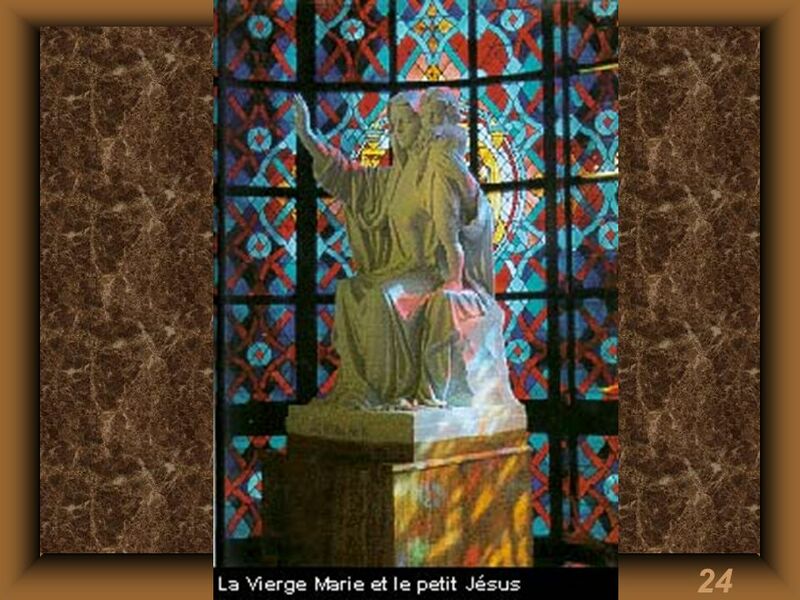 (annoncer) Nous__larrivée de notre famille de Paris. 2. (corriger) Nous__toujours nos fautes de grammaire. 3. 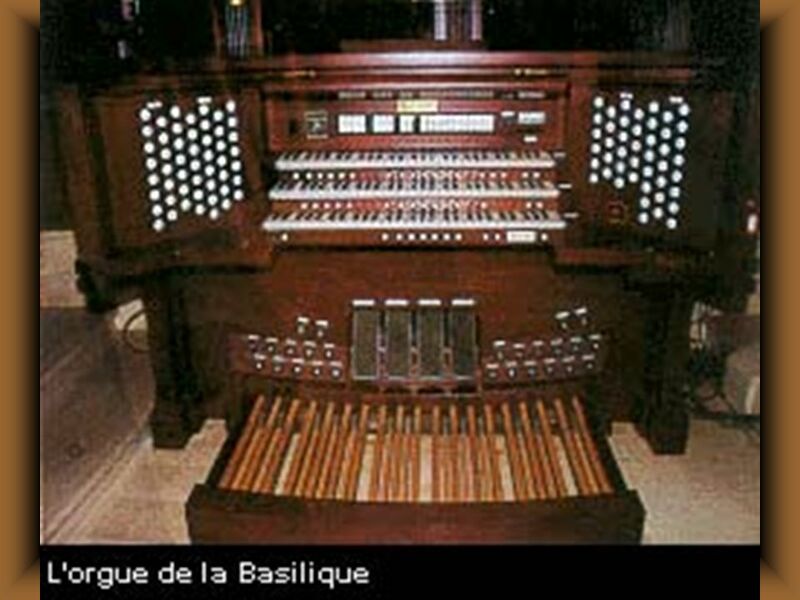 (envoyer) J__des cadeaux a ma famille chaque.